Enchiladas Suizas is a phrase used quite liberally these days to describe a wide range of enchilada dishes. Variations will get even wilder once you head north of the U.S./Mexico border. 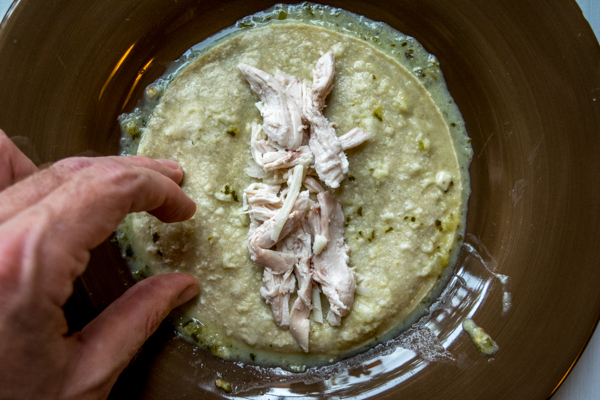 Luckily it’s easy to return to the essence of the dish by building a traditional green sauce and mixing it with a bit of cream. This will give you an authentic, mouth-watering meal that comes with a hidden benefit; your tastebuds will now have a Suiza-meter for the rest of your life that will help you detect the real Suiza (or not). We’ll be using creme fraiche here, but you can always use Mexican Crema or heavy cream to get a similar result. Also note that you can substitute jalapenos for the serrano peppers if it’s hard to find serranos in your area. Rotisserie chicken will work in a pinch but for this batch I poached a chicken breast with some onion, cilantro and a pinch of salt. Bring to a boil, reduce heat, and let simmer until cooked through, about 15-20 minutes. You can pan roast the tomatillos and poblano but I usually just throw them in the oven at 400F. Add the roasted tomatillos to a blender along with ½ white onion, 2 cloves garlic, ½ serrano, and 10 cilantro sprigs. 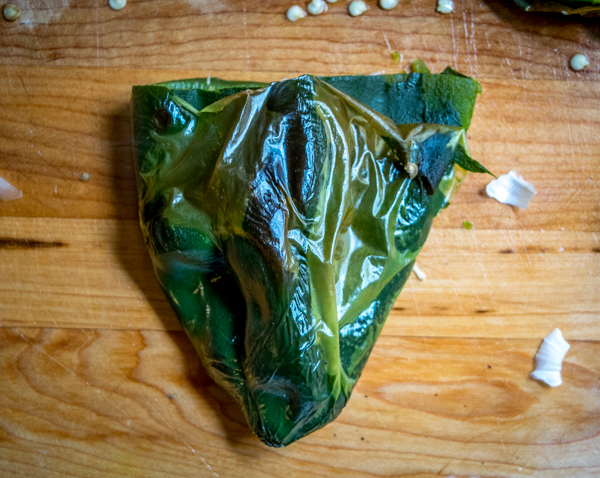 Once the poblano starts to get charred it is mostly roasted. Cut off the stem and de-seed the poblano. You can also scrape off the blackened bits of skin but don’t worry about getting every last bit. Heat a dollop of oil in a saucepan on medium heat. Add green sauce from blender and cook for a few minutes. 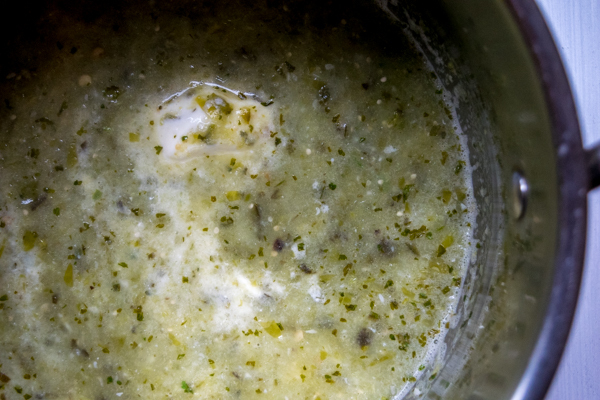 Add 1 cup chicken stock and ¼ cup creme fraiche to the simmering green sauce. Cook on medium-low heat until heated throughout. Use two forks to shred the chicken and mix with a few tablespoons of finely chopped onion, a handful of cheese, and dashes of salt. This is the inner mixture of the enchiladas. You also have the option of adding a few tablespoons of the green sauce or even a bit of the creme fraiche to this mixture. Okay, heat the tortillas in the oven for a few minutes. This will make them easier to roll up. 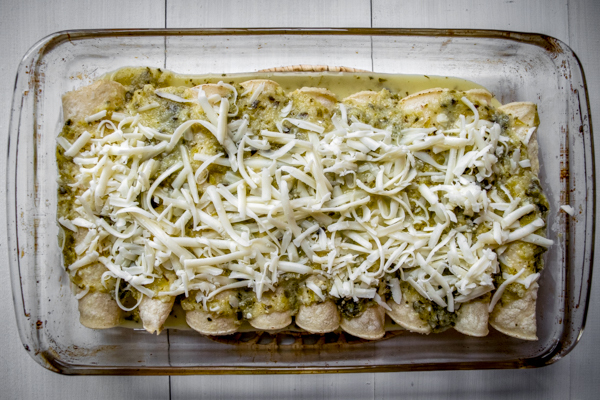 Prepare your baking dish for the enchiladas by adding a few spoonfuls of the green sauce and spreading around. This will prevent the enchiladas from sticking. On a plate, add a couple spoonfuls of the green sauce. Dredge a tortilla in the sauce, flip, and fill with a small handful of the chicken mixture. Roll up and place on the baking dish. Keep going ‘til the chicken is gone. 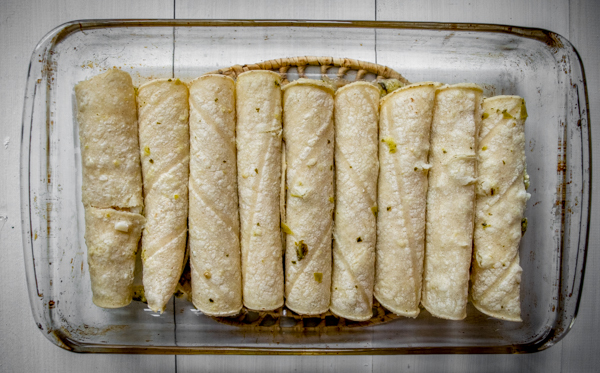 This recipe will make 6-8 enchiladas depending on the size of your tortillas. Add the remaining sauce on top of the enchiladas along with a layer of cheese. Bake for 10-15 minutes or until all the cheese is melted. Cilantro and a drizzle of crema are optional garnishes that will help finely tune your brand new Suiza-meter. You could also consider serving this with our Mexican Green Rice. P.S. Spend 30 seconds scrolling through our Mexican Cooking Survival Guide and you’ll have 27 new options for dinner tomorrow night. 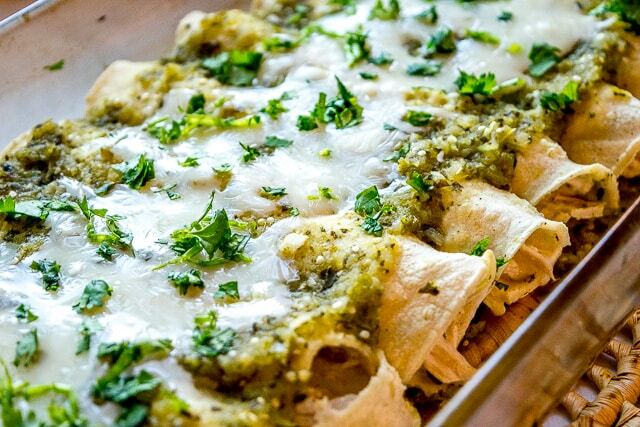 Building a traditional green sauce and mixing it with a bit of cream will make your Enchiladas Suizas the real deal. 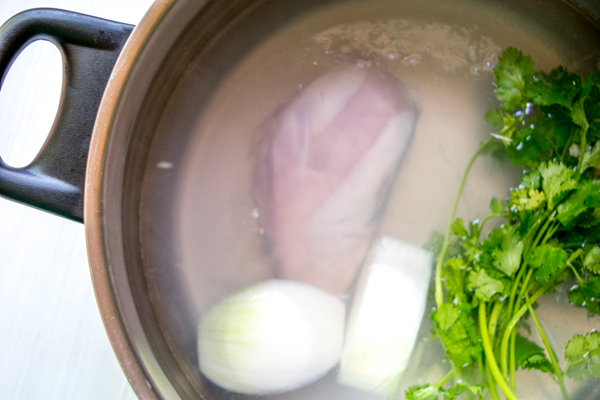 To poach the chicken, cover the chicken breast with water and bring to a boil. Add a half onion, cilantro sprigs and a pinch of salt for additional flavor. Once boiling, reduce heat and let simmer for 20 minutes or until the chicken is cooked through. Once cooked, set aside to cool. Meanwhile, roast the tomatillos and poblano in the oven at 400F. The tomatillos will be done roasting when they turn army green, about 10-12 minutes. The poblano will need a bit longer. Add the tomatillos to a blender along with 1/2 onion, 2 garlic cloves, 10-12 sprigs of cilantro, and 1/2 of a serrano pepper. Cut off the stem and de-seed the roasted poblano. Add it to the blender and pulse blend with the other ingredients. Taste for heat level and add another half of the serrano if you want more heat. Heat a dollop of oil in a saucepan on medium heat. Add the green sauce from the blender and simmer for a few minutes. Add 1 cup chicken stock and 1/4 cup creme fraiche to the mixture (or heavy cream). Cook on medium-low until heated through. 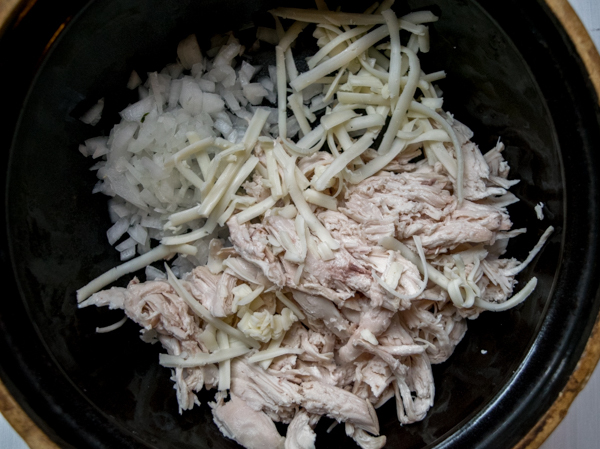 Use two forks to shred the chicken and add it to a mixing bowl along with 2-3 tablespoons finely chopped onion, a handful of cheese, and dashes of salt. You can also add some green sauce or cream if you want. 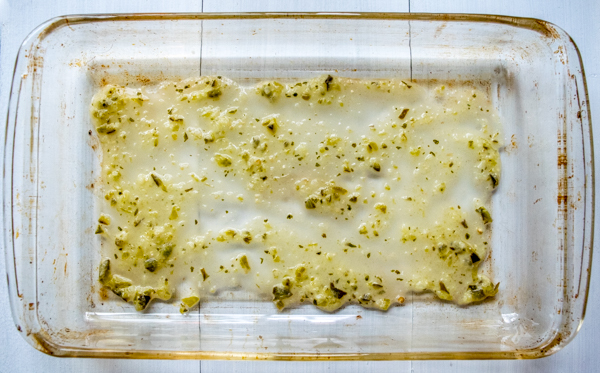 Prepare the baking dish by adding a few spoonfuls of the green sauce to prevent sticking. On a plate, add a couple spoonfuls of the green sauce. Dredge a tortilla in the sauce, flip, and fill with a small handful of the chicken mixture. Roll up and place seam side down on the baking dish. Keep going ‘til the chicken is gone. Add the remaining sauce on top of the enchiladas along with a final layer of cheese. Optional garnishes include freshly chopped cilantro and a drizzle of Crema. Once you’re familiar with this style of making enchiladas you can swap out a few ingredients and make our Red Sauce Enchiladas or our Colorado Enchiladas. And for a list of even more Mexican entrees you can make tonight, click here. 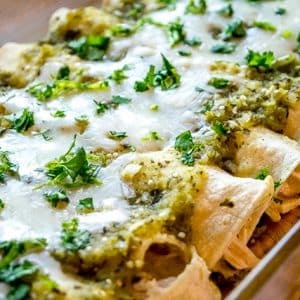 These enchiladas look absolutely amazing! 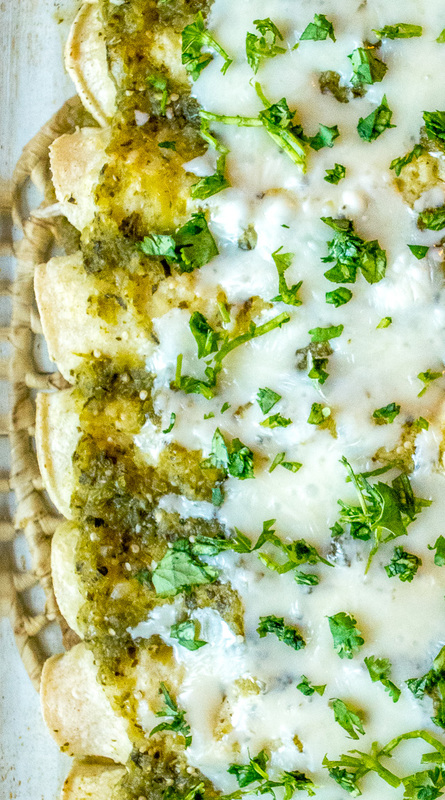 Enchiladas verde are always my favorite kind, and your version is calling out to me. I must try these soon! That enchilada sauce looks awesome – totally going to try these! I made these last night with the leftover Thanksgiving turkey. Maybe I’m finally getting better at cooking because these did not seem like the pain to make as I usually find enchiladas to be. I like how I can just throw the vegetables in the blender and I don’t have to chop, chop, chop. Finishing the sauce on the stovetop was a breeze. My only regret was that I didn’t have the creme fraiche, which I swear I had that morning. I had bought it previously for the taquito recipe on this site (which are delicious, by the way). I must have inadvertently thrown it away while cleaning the fridge from some Thanksgiving leftovers. Dang. So, I used cream cheese, which doesn’t melt as easily. Next time I make this, I’ll do the creme fraiche. Regardless, we all found it scrumptious and this will be my go-to suiza enchiladas recipe. Thanks, Patrick. Top of my list would probaby be Crema or heavy cream. Followed by plain Greek yogurt with maybe a hint of mayonnaise. All cooked at a mild simmer so they don’t break down. Thanks much for your note Diana, it’s so helpful. I just made these. They are pretty fantastic! I used Mexican crema, I usually make Mexican dishes at least twice a week so it is always on hand. I am more of a beef enchilada person but I had a few tomatillos I needed to use up and now I think I will have to make these again! Doubled the recipe, used a whole chicken, put some green sauce, cream, and cheese on chicken. These were amazingly delicious. Will definitely make again. Thank you so much for postin. Great Sylvia! Thanks for your feedback, I’m glad they worked out for you. Hi, I was wondering if I could store the green salsa in jars?.If yes, how long can I store them? By the way I made this recipe with mom yesterday and it was so delicious. Awesome, thanks for the feedback Leiry! Hmmm the green salsa will keep for at least a few days in the fridge, but to be honest it will lose some of its zip after a day or two. That’s assuming you don’t add any cream to it before storing as I feel like the salsa with cream added wouldn’t last too long. 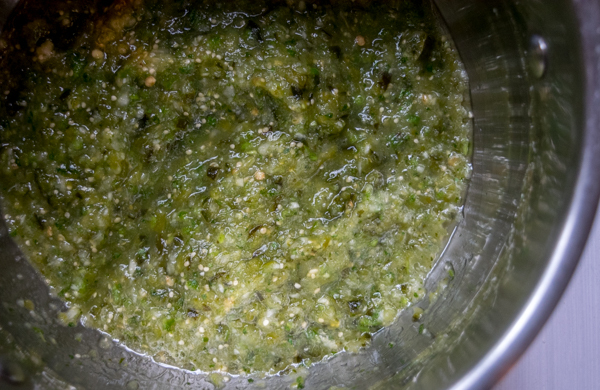 If you want to make a big batch of the green salsa I would plan on re-seasoning before use by adding some additional jalapeno/serrano for heat and also some salt to taste, and then adding cream as a final step just before eating. I hope that helps a bit. Let me know if you have any other questions! Cheers. love this recipe!!! I however followed a recipe that called for 5 Serranos and that was way to spicy for my taste. I am making these again for a potluck this weekend and I will go ahead and follow your recipe. I am excited to add the chile poblano I didn’t do this in the last recipe I followed. one thing I did do different and took the enchiladas to another lever was to mix the shredded chicken with melted cream cheeses and onions. I brought the left overs to work the next day and my coworkers loved them. Thanks for your note Maira! 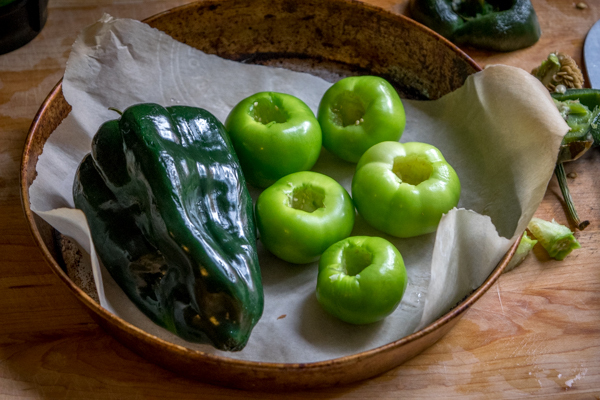 Yeah serranos have some serious heat — you can always add them incrementally and taste test along the way, this will prevent your sauce from turning nuclear. Cream cheese with the chicken is a great idea and if you use it with this Suizas recipe you’ll be a very happy camper. 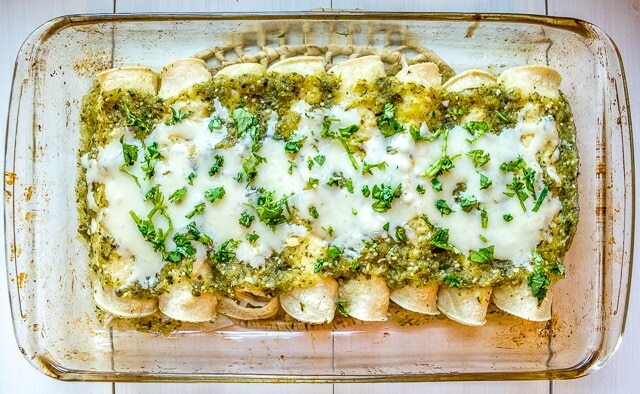 Wondering if you have tried freezing these enchiladas? I love making a double batch of enchiladas and freezing half to pull out for supper on a busy night. But I am concerned that the cream in the sauce won’t work after it is frozen. Please let me know. Hi Ruth! I never freeze these enchiladas because, like you, I’m hesitant to freeze creamy sauces. One workaround could be to build the sauce without the cream and then just use the cream as a final garnish when you re-heat the enchiladas. It might not be the same but you could probably get pretty close to the original flavor profile by doing it this way. Hope that helps a bit. Cheers.